Sweet, pulpy, and fragrant rich cherimoya is one of the most delicious tropical fruits of Andean valley origin. These greenish-yellow, conical fruits are from the evergreen trees belonging to the family Annonaceae, in the genus of Annona. The plant has been thought to be native to Loja region of Ecuador, bordering Peru, the low rising tropical forests of Central Andean Mountains. Annona is a small-sized tree, grows to about 15 to 30 feet tall with dense foliage, and bears fruits after 4-5 years of plantation. At their natural habitat, cherimoya flowers are pollinated by insects (Coleoptera, Hemiptera). However, in the cultivated farms, artificial pollination is done at large to obtain good yields. The fruit is irregularly oval or conical in shape, features leathery dark-green skin with polygonal indentations. It measures about 10-15 cm in length and 10 cm in diameter and weighs about 350 g to 500 g, and in some varieties weighing several pounds. Ripe fruits turn pale green to light brown and emanate sweet, fragrant aroma that can be appreciated from a distance. Inside it features, creamy pulp with smooth, shiny, black seeds embedded in the flesh. Seeds and skin are inedible. Custard apple (Annona reticulata) is another small size fruit commonly grown in India, Pakistan and other South Asian regions. It features smooth, conical indentations. 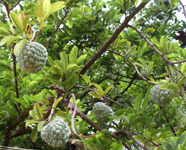 Sugar apple or atis fruit (A. squamosa) features smooth conical protuberances (carpels) over its surface. It has similar taste and flavor as cherimoya; however, on its interior, it contains relatively less flesh but more seeds for its size. 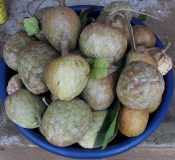 Atemoya is hybrid of cherimoya (A. cherimola) and sugar apple (A. squamosa). It has better temperature and humidity tolerance, suitable for cultivation under tropical climates. Guanabana (Annona muricata), also known as soursop (graviola), is much larger in size than cherimoya. It is easily distinguished by its size, spiky surface, and fibrous, tart flesh. Very sweet and pleasant flavor annonas contain an impressive list of essential nutrients, vitamins, antioxidants, and minerals. The fruit has calories equivalent to that of mangoes. 100 g of fresh fruit pulp provide about 75 calories. It, however, contain no saturated fats or cholesterol. The fruit characteristically is a good source of soluble dietary fiber (3 g% or 8% of RDA) which helps lower absorption of cholesterol in the gut. The fiber also helps protect the colon mucosa from exposure to toxic substances by binding cancer-causing chemicals to it. Cherimoya contains several polyphenolic antioxidants. Among them, the most prominent in Annona family fruits are Annonaceous acetogenins. Acetogenin compounds such as asimicin, bullatacinare, etc., are powerful cytotoxins and have been found to have anti-cancer, anti-malarial, and anti-helminth properties. It is very good in vitamin-C. Vitamin-C is a powerful natural antioxidant. Soursop (A.muricata) relatively has more vitamin-C (34% of RDA). Consumption of fruits rich in vitamin-C helps the human body develop resistance against infectious agents and scavenge harmful, pro-inflammatory free radicals from the body. Also, cherimoya fruit is a good source of B-complex vitamins, especially vitamin B-6 (pyridoxine). 100 g fresh fruit provides 0.257 mg or 20% of daily recommended levels. Pyridoxine helps keep up GABA neurochemical levels in the brain. High GABA levels calm down nervous irritability, tension, and headache ailments. At its natural habitat, cherimoya season lasts from November until May. Usually, the fruit is handpicked by clipping upon reaching maturity. In the markets, buy fresh, firm, medium-sized, uniform fruits featuring greenish-yellow color and full for their size. Ripe fruits just yield to gentle pressure. Avoid those with broken skin, surface blemishes and overly-ripen ones as they stay poorly. Once at home, keep mature fruits in a fruit basket at room temperature until them ripe. Cherimoya has a very short shelf life. Once ripen, it quickly deteriorates at room temperature. As in bananas, the whole cherimoya cannot either be stored inside the refrigerator for an extended period as they sustain chilling injury. However, juiced or pureed, the fruit may be kept in the freezer for several weeks. Cherimoya has unique fragrant flavor and delicious taste. To prepare, wash the fruit in cold running water. Gently mop dry using a paper towel. Cut the fruit lengthwise and eat it scooping with a spoon. Discard seeds and peel. The fruit is better eaten out of hand on its own, without any add-on or seasonings. Cherimoya juice is a refreshing drink. Tart flavored guanabana or soursop can be mixed with honey, sugar, milk, and ice; and serve chilled as sorbet or with other fruit cocktails and milkshakes. 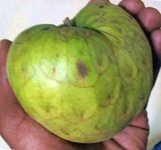 <<- Read Custard apple nutrition facts. <<-Back to Fruits from Cherimoya. Visit here for an impressive list of all variety of fruits with complete illustrations of their nutrition facts and health benefits. United States Department of Agriculture- National Nutrient Data base.